Bachelor's degree from Prescott College in Interdisciplinary Arts. This included the classes Appalachian Folk Choir and Appalachian String Band. High school included two years of choir and a performance in the school musical. 10 years of private piano instruction. Emphasis on classical. Self-taught on guitar and ukulele and autoharp. 15 years of dance lessons, 5 of which were part of a performing group. 10 years of performing professionally and touring nationally and internationally around Europe, working with agents in Spain and Germany and a record label in France. Four years of private lessons to diverse ages, including piano, 5-string banjo, ukulele, and beginning guitar. One semester of teaching at the Front Porch, an old-time music school in Charlottesville. I believe in student self-direction, where the dream and vision of musical mastery, as well as the student’s particular interests, guide the path of learning. I am here to share what has gotten me to where I am as a musician. It’s up to me to bring the best tools and perspectives to match the student’s needs. It is up to the student to commit to the joyful practice of music, so we can both delight in watching milestones fly past. 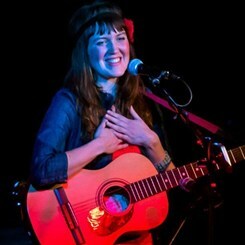 Virginia-born singer-songwriter Annabeth McNamara has toured the west coast and Europe. She has spent years in both the colorful culture of southern France as well as the desert of Arizona. She recently returned to her Appalachian roots to explore a more sustainable career and work with her back-up band, Larkspur. In July 2014 she won a $75,000 grant to record her album “Surprise” at House Studio, voted the capital’s best recording studio. Of the album, whurk magazine recently wrote, “This album has all the trappings of a sleeper hit by Ingrid Michaelson or Kate Nash, perfectly encapsulated by the sugary folk pop of the title track.” Adventure, romance, heartbreak, and wanderlust inform her poetic and original lyrics, set to the strums of eclectic instruments. Although acoustic at heart, she is influenced by the American pop that forever entices her forward into fresh soundscapes. This past year was a highlighted year, as Annabeth made it onto the first round of the Grammy Ballots, to be considered in multiple categories, including Best Pop Album, Best New Artist, and Best Roots Performance. Her album, Surprise, charted on iTunes top 100 Singer-Songwriter albums. Request Lessons with Ann today!